As I’ve previously mentioned, basic income proponents fundamentally understand that our economy has the resources to do better for humanity. Andrew Yang understands this. He also understands that the economy exists to serve the people. Yang is a candidate running for United States president in 2020. His campaign slogan is “Humanity First” and he’s running with basic income front and center on his platform. Two weeks ago, I had the privilege of seeing Andrew Yang speak at a town hall meeting campaign event in Henniker, New Hampshire. He’s smart and he cares about people. I like him. For political strategy reasons, Yang has named his basic income plan The Freedom Dividend. It has an American-sounding ring to it, no? He plans to direct Congress to enact the plan soon as he takes office. Unfortunately, Andrew Yang’s Freedom Dividend has a serious flaw. The flaw lies in how he plans to fund it. If you’ve been following along, you’ll recall from my first post that what makes basic income possible is that the economy has untapped productive potential. Consumers need spending money to be able to tap into that potential. But the market lacks a mechanism to provide consumers with the required funds. Basic income is the solution. Yang wants to fund his basic income using a tax. Perhaps he just doesn’t understand that tax revenue is meaningless. That’s forgivable. What’s not forgivable is the particular tax he plans to use: the value-added tax or VAT. I explained last week that taxes create incentives. For those of you unfamiliar with the VAT, it is a blanket tax on all production in the economy. It creates a direct incentive for our economy to produce less. The higher the VAT, the less untapped productive potential we have and the less basic income we can afford. The mechanism that Andrew Yang wants to use to help us afford basic income will literally have the opposite effect. Even though it’s a mistake, I can understand why Yang chose the VAT. It makes moral sense to him. As is the cliché, he sees technological unemployment as a grave existential threat to our way of life. By taxing all production, he would be taxing the very technology that’s eliminating the jobs. It only seems fair. The VAT is a typical counterproductive response to technological advancement. Instead of working less, we use economic policy to create jobs. Instead of embracing higher productive potential, we slow it down through taxes. Instead of providing consumers with spending money, we let productive capacity sit idle. Basic income is the correct response. Andrew Yang is right about that. One saving grace of Andrew Yang’s basic income plan actually stems from another flaw: he has decided to limit the amount of the basic income to $1,000 per month. This limitation prevents consumer spending from activating the economy’s full productive capacity. With this limitation in place, it might not matter that the VAT has diminished that capacity. During the town hall meeting, I asked Yang why he chose to set his basic income at a level of $1,000 per month. He punted on the answer. Instead of defending his choice, he reminded the audience that it wasn’t his idea. He had copied his plan from basic income advocate Andy Stern. Andy Stern, you’ll recall, was on the losing team in last year’s lopsided Intelligence Squared basic income debate. Andy Stern was confused about basic income and that confusion has spread to Andrew Yang. Despite its self-sabotaging nature, Andrew Yang’s Freedom Dividend might actually work. Even while being hammered by a VAT, the economy could still have enough capacity to respond productively to consumers each having an extra $1,000 per month. A poorly-designed basic income is probably better than no basic income. If this does indeed work, it will be despite the VAT and not because of it. A VAT is not necessarily the end of the world. Most of the world’s developed countries are already surviving in spite of a VAT. This past spring, our weekly Boston Basic Income discussion group explored Yang’s basic income plan. You can read more about the plan in the FAQ on Andrew Yang’s campaign website. There is plenty more material there worth criticizing. Of course this is backwards. Inflation occurs when consumer spending outstrips production. By reducing the economy’s productive capacity, the VAT increases the likelihood of inflation. 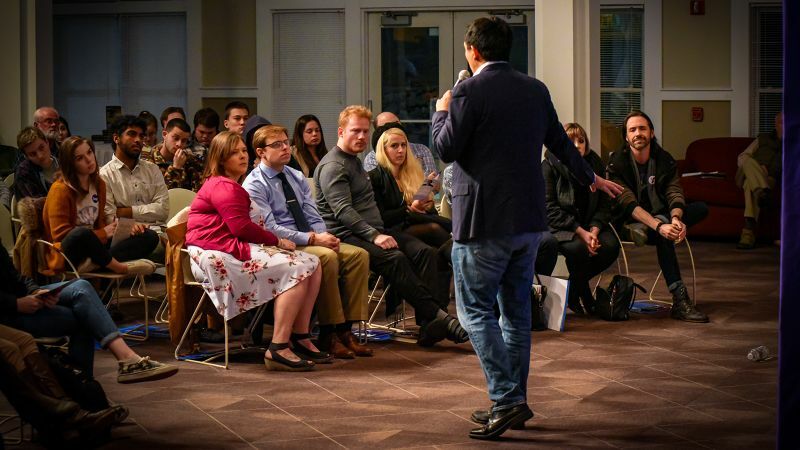 Although he might not have the details worked out, Andrew Yang is calling attention to very real problems in our economy and bringing them up to public consciousness. These are important issues that are largely being brushed aside by mainstream politicians. The 2020 election cycle is still in its infancy, but I’m glad we have someone like Andrew Yang to start making some noise. It can be easy to forget that the economy exists ultimately to serve the people. Andrew Yang is here to remind us.